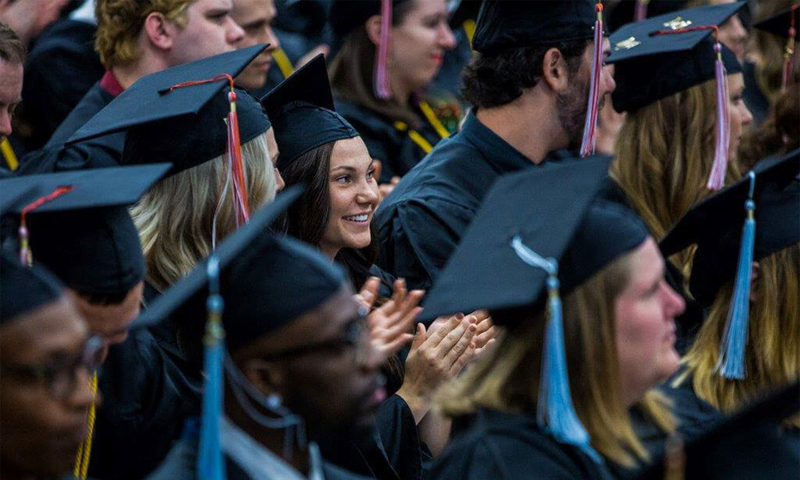 Concordia University Ann Arbor will honor 164 graduates and four awardees during its spring commencement exercises. On Sunday, May 20, 125 undergraduate and 39 graduate students will cross the commencement stage. Ceremonies that day begin with an 11 a.m. baccalaureate ceremony in the Chapel of the Holy Trinity, 4090 Geddes Road, followed by commencement in the field house at 2 p.m.
Rev. Dr. Gregory P. Seltz, former speaker of The Lutheran Hour radio program and executive director of The Lutheran Church-Missouri Synod’s new Lutheran Center for Religious Liberty in Washington, D.C., will deliver the commencement address. Seltz holds a bachelor’s degree in New Testament-Biblical Languages from Concordia Ann Arbor, along with a Master of Divinity degree from Concordia Seminary in St. Louis. Stephanie E. Johnston, a Health and Human Performance major from Brantford, Ontario, will deliver the student address. Director of Campus Ministry Rev. Randall Duncan will serve as preacher for the baccalaureate service. Mr. Randall Luecke will receive an Honorary Doctor of Laws degree in recognition of his many years of service to the university. Chief financial officer for Eckerd Connects in Clearwater, Florida, Luecke served as Chief Financial Officer and then Acting President at Concordia University Ann Arbor prior to the merger with Concordia University Wisconsin. A publisher of more than 70 articles on accounting, finance and human resource topics, he received his master’s degree from Lehigh University. Rev. Stephen P. Starke, pastor at St. John Lutheran Church in Bay City, Michigan since 2000, will receive the Christus Primus Award, awarded annually for distinguished service to the church and to society. Rev. Starke earned an honorary doctor of divinity from Concordia University Wisconsin in 2011. He attended Concordia Theological Seminary in Fort Wayne, Indiana, where he earned a master of divinity in systematic theology in 1983. Dr. Michael Kramer, a prolific research scholar and publisher of 6 books and 60 journal articles, will receive Concordia’s Outstanding Alumnus Award, presented each year to an alumnus/alumna who has rendered notable service to the university and to the Church, and to recognize faithful stewardship of his or her talents. He is on the University of Oklahoma faculty, after previously teaching at the University of Missouri. The 1974 Concordia Ann Arbor graduate has served as department chair at both universities for a combined 15 years. Concordia’s commencement speaker, Rev. Dr. Gregory P. Seltz, will receive an Honorary Doctor of Divinity, awarded to an individual who is a member of the clergy, and who has demonstrated significant contributions in the area of leadership or service to The Lutheran Church-Missouri Synod. Click here for more details on commencement. 15 Years of Teaching Church History: Resolution?